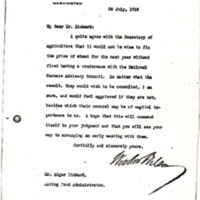 Woodrow Wilson tells Edgar Rickard that he agrees with David Houston regarding fixing the price of wheat. I quite agree with the Secretary of Agriculture that it would not be wise to fix the price of wheat for the next year without first having a conference with the National Farmers Advisory Council. No matter what the result, they would wish to be consulted, I am sure, and would feel aggrieved if they are not, besides which their counsel may be of capital importance to us. I hope that this will commend itself to your judgment and that you will see your way to arranging an early meeting with them. Wilson, Woodrow, 1856-1924, “Woodrow Wilson to Edgar Rickard,” 1918 July 26, WWP19468, Hoover Institute at Stanford University Collection, Woodrow Wilson Presidential Library & Museum, Staunton, Virginia.